I told Little Miss M that we could take the butts from our loaf of bread and feed the fish. Our cleaning lady overheard this and looked uneasy. She thought we were going to go out in the hall and feed the fish that clearly have a sign reading, "Do Not Feed or Touch the FISHES!" (I will take a picture of this sign and post it later.) Obviously, I didn't mean the fish in the aquarium. 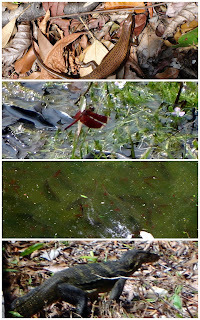 Uncertain, as to where we can actually find fish to feed, we set out to explore the Lornie Trail at MacRitchie Reservoir. There must be fish in the reservoir we can feed! Once we arrive and find a trail to take, I notice the "Do Not Feed The Monkeys" sign posted. Hmmmm...well, we can take the bread out, try to feed the fish and hope the monkeys don't come looking for a fight; or, we can save the bread for an excursion tomorrow to feed some fish. Save the bread it is, now to explain this to a 3-year old, dead set on feeding the fish right now...try to distract, try to keep walking, try to explain we don't want the monkeys to get us...she isn't going to let this one go is she? Where does she get this determined, my-way-or-the-highway attitude?! Along the way of the uneasy Lornie terrain, we saw an entrance to a boardwalk along the water. Turns out to be Chemperai ~ the boardwalk connected by Lornie Trail, to another boardwalk, Jering. This route was much easier to get through with the stroller. I don't recommend bringing a stroller to begin with, but I didn't know better. The beginning of the trail, was loose rock and gravel, leading into an uneven path with rocks and tree roots. Fine, if you don't have a stroller! The boardwalk was much better, but the kids walked most of the boardwalk path anyway, so the stroller only came in handy when they were hungry. They were able to hide in the stroller with their sandwiches, so the monkeys couldn't see them eating. I don't know if that was the real reason the monkeys didn't come out, or if it was the light rain. Little Miss M liked the thought of hiding from the monkeys better, so we went with that! Plenty of other critters to welcome us along the trail. 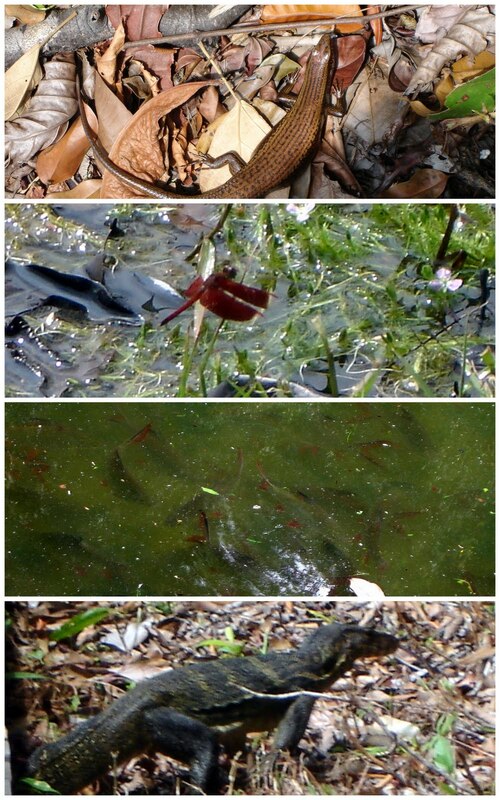 A few different lizards, fish, and many different birds. The most frightening by far came into sight at the very end of our journey. The kids were in the stroller, eating their sandwiches and suddenly it appeared crawling out of the water, less than 2-feet in front of us. Thank goodness the path is elevated, or I would've freaked and probably tipped the stroller into the water trying to get away! The thing was huge ~ at least a 4 foot tail. Crawling, on it's huge 4-legs, I thought it was a crocodile. As it passed under the path we were now, standing still on, trying to figure out which direction to run, it crawled into the trees and scurried away. Eek ~ I can now breathe again! Unable to see it, but know that it is still there, in the trees, just out of sight. We quickly passed by, so it's long slithering tongue didn't reach out and grab me! Crazy beast!